Weed is a slang term for marijuana or cannabis. It is an illegal drug to possess in the United States. Some people have a medical card that allows them to grow, manufacture and possess marijuana but only under strict regulations. Weed is considered one of the most commonly abused and illicit drugs in the United States, the National Institute on Drug Abuse notes. Weed contains delta-9- tetrahydrocannabinol, or THC, which gives smokers a high when the chemical is released into the body. The main reason why smoking or possessing weed or cannabis is illegal is because of the Controlled Substances Act or CSA. 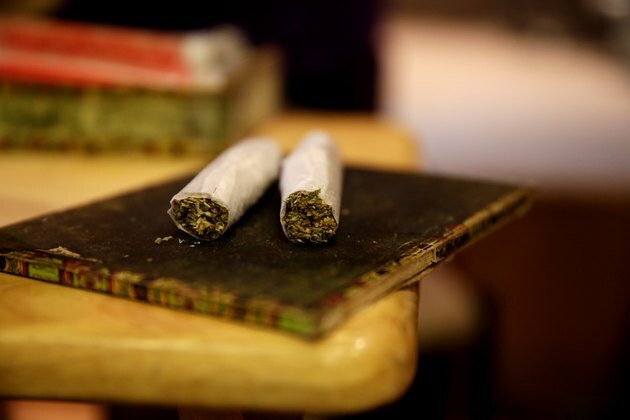 The U.S. Drug Enforcement Administration explains that the act, along with the Comprehensive Drug Abuse Prevention and Control Act of 1970, grants the legal basis for the government to fight against weed and other illegal drugs on the street. This is a federal law that regulates the distribution, manufacturing and use of illicit drugs. Individual states and counties often have their own punishment and sentencing guidelines in place for individual marijuana drug possession crimes. When you smoke weed or marijuana, you can experience a myriad of side effects including; sleepiness, loss of thoughts, difficulty concentrating, a very slowed reaction time, a time warp feeling or altered perception of time along with anxiety. All of these symptoms can interfere with your daily life, including taking care of a minor child. If you are driving while impaired, you could hurt yourself or other people on the road. Smoking weed itself has dangers, even aside of the impairment and side effects; this is another reason the government will not legalize it. The DEA states that smoking marijuana can leave behind four times as much tar than what is found in a single cigarette. This can increase your risk for lung related disorders and certain kinds of cancer. Smoking weed also reduces your white blood cell count--an important factor in keeping your immune system healthy and fighting off illness. Marijuana is considered a street drug because it can be bought and used on the street. All the sales of weed that occur on the street is considered illegal. The drug trade on the street can put several lives in danger, including your own. If you want to smoke weed you will need to acquire it, which will put you at risk for not only your health but also your personal safety. Not every state in the union has legalized medical marijuana. It is legal in 14 states and the District of Columbia as of 2010, the Pro Con organization explains. Laws and rules vary per state, and you must have a medically approved I.D. card before being eligible to grow or smoke weed. You must have a severe medical condition such as cancer, AIDS or chronic pain before a medical doctor will issue you a card. If you are caught smoking or possessing weed without a valid medical card you could be arrested and face criminal prosecution.